Speculation: Diablo II: Remastered & Diablo III Expansion? The past several months have added bits of breadcrumbs pointing at Diablo II: Remastered, but this job opening posted on December 21, 2017 — sounds pretty crystal clear on what the intentions are. This job opening is posted in the “CLASSIC GAMES” category, by the same team that developed the StarCraft: Remastered. It is important to mention that we interviewed Brian Sousa at BlizzCon 2017, and he mentioned two Classic Games his team wishes to make a Remastered of: Warcraft III and Diablo II. Follow the link to jump to that quote in the video. 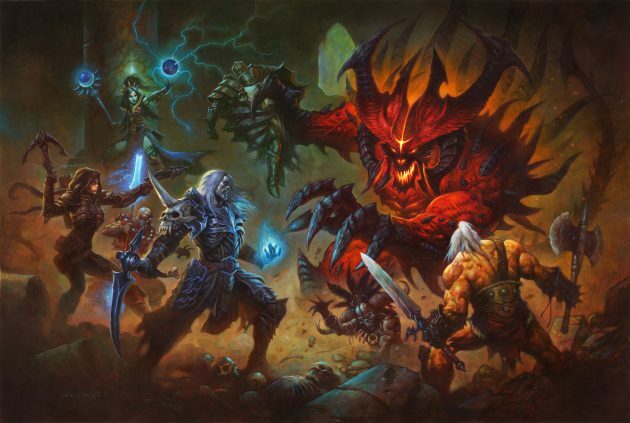 Investigate opportunities for the future of the Diablo franchise. There is, however, a clue in one of the quotes by Tyrael (in Act V) that hasn’t been resolved yet. It is unknown when, or how Blizzard plans to address that, but Tyrael does mention that he sent Horadrim members to the Skovos Isles — which is the Amazon lands: “I haven’t heard back from the Horadrim we sent to the Skovos Isles.” Could that hint at an expansion that adds Skovos? A Diablo III: Amazon Pack, or both? The job opening for Senior Software Engineer also has the requirement to have experience in various platforms, which means experience in XBox 360/One and PlayStation 4. You can see the job opening here. 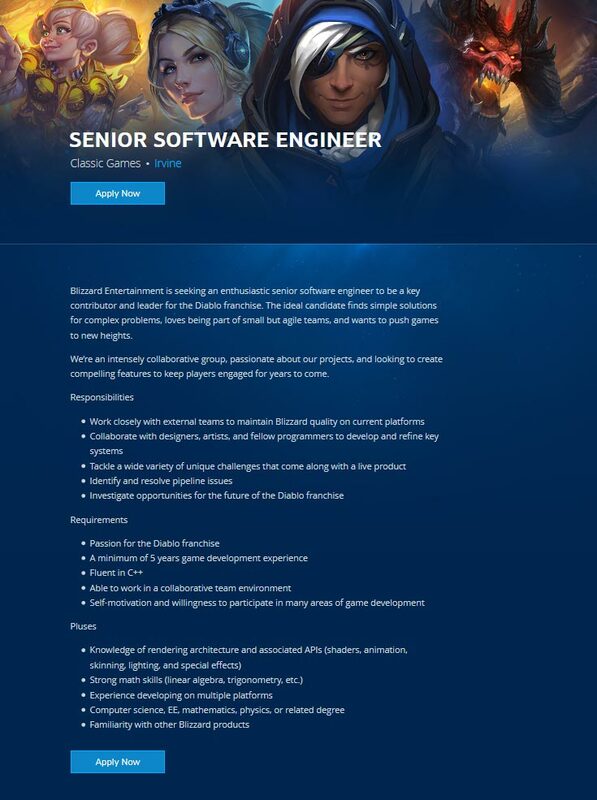 Blizzard Entertainment is seeking an enthusiastic senior software engineer to be a key contributor and leader for the Diablo franchise. The ideal candidate finds simple solutions for complex problems, loves being part of small but agile teams, and wants to push games to new heights. We’re an intensely collaborative group, passionate about our projects, and looking to create compelling features to keep players engaged for years to come. New patch available in the PTR addressing new changes to all classes, and certain items. Mostly buffs across the board. Lots of bug fixes, and Challenge Rifts now drop more materials per cache, and 10 Death’s Breath are guaranteed in each cache. 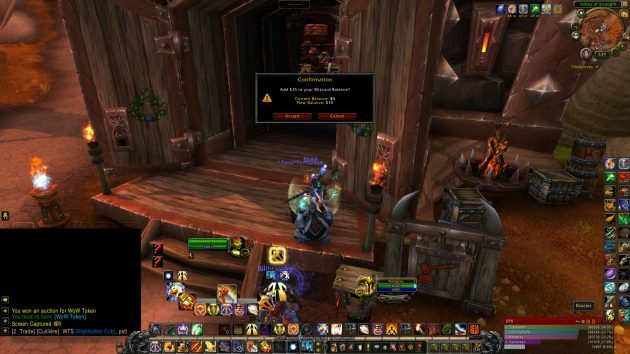 Blizzard Entertainment deployed a new PTR patch, and shared the preliminary patch notes. This patch makes changes to some class abilities, runes, and passives, as well as changes to Legendary and Set items. Addresses a few bug fixes to items, and Adventure Mode. Bloodshed (Has been redesigned): Deal damage equal to 20% of your recent Critical Hits to enemies within 20 yards every 1 second. Tempest Rush (Flurry): Reduced the maximum number of stacks from 500 to 100. Devour (Voracious): Resource cost reduction stacks granted from this rune will now stack and are no longer overridden from multiple casts. Simulacrum: Added a glow to the skill icon to indicate when Simulacrum is active. Bone Armor: Essence cost removed. Can now be cast while moving. Fueled By Death: The movement speed bonus from this passive can now exceed the 25% cap. Soul Harvest: Adding a stack or refreshing Soul Harvest now refreshes all stacks of Soul Harvest. Many Legendary and Set items have had their drop chance increased. Bracers of Destruction: Seismic Slam deals 300–400% 400-500% increased damage to the first 5 enemies it hits. Bracers of the First Men: Hammer of the Ancients attacks 50% faster and deals 150–200% 300-400% increased damage. Fury of the Vanished Peak: No longer rolls Legendary-strength bonus to Seismic Slam damage as an inherent affix. Can still roll 10-15% as a random affix. Gavel of Judgement: No longer rolls Legendary-strength bonus to Hammer of the Ancients damage as an inherent affix. Can still roll 10-15% as a random affix. Hammer of the Ancients returns 20–25 Fury if it hits 3 or fewer enemies. The damage of Hammer of the Ancients is increased by 400-500% and it returns 25 Fury if it hits 3 or fewer enemies. Girdle of Giants: Seismic Slam increases Earthquake damage by 80–100% 200-250% for 3 seconds. Standoff: Furious Charge deals increased damage equal to 200–250% 400-500% of your bonus movement speed. Heaven's Fury gains two additional rays and has its damage increased by 150-200%. The damage of Lashing Tail Kick is increased by 300% 450-600% to the first 7 enemies hit. Bloodsong Mail: While in the Land of the Dead, Command Skeletons gains the effect of all runes and deals 100–125% additional damage and gains the effect of the Enforcer, Frenzy, Dark Mending and Freezing Grasp runes. Bloodtide Blade: Death Nova deals 20–30% 80-100% increased damage for every enemy within 15 25 yards. Dayntee’s Binding: You gain an additional 40–50% damage reduction when there is an enemy afflicted by your Decrepify any of your curses. Defiler Cuisses: Your Bone Spirit's damage is increased by 75–100% 400-500% for every second it is active. Fate’s Vow: Army of the Dead now deals an additional 200-250% damage and gains the effect of the Unconventional Warfare rune. Golemskin Breeches: Your Golem's damage is increased by 100–125% and You take 30% less damage while it your Golem is alive and the cooldown on Command Golem is reduced by 20-25 seconds. Leger’s Disdain: Grim Scythe deals an additional 7–10% 65-80% damage for each point of essence it restores. Lost Time: Your cold skills reduce the movement speed of enemies by 30%. In addition, your movement speed is increased by 4–5% 8-10% for 5 seconds. Maximum 5 stacks. Maltorius’ Petrified Spike: Bone Spear now costs 40 Essence and deals 375–450% 550-700% increased damage. Mask of Scarlet Death: When paired with the Revive: Purgatory rune, the mega-revived monster will drop the same number of corpses were used to create it on death. This item will now attempt to give preference to the strongest monster to become the mega-revive when selecting a group of corpses. Nayr’s Black Death: Each different poison skill you use increases the damage of your poison skills by 50–65% 75-100% for 15 seconds. Scythe of the Cycle: Your Secondary skills deal 250–300% 350-400% additional damage while Bone Armor is active but reduce the remaining duration of Bone Armor by 4 seconds. Steuart’s Greaves: You gain 40–50% 75-100% increased movement speed for 2 10 seconds after using Blood Rush. The Johnstone: Each corpse consumed in the Land of the Dead gGrants a 50 stacks of Macabre Knowledge when Land of the Dead expires. Macabre Knowledge increases the damage of Corpse Lance and Corpse Explosion by 150–200% while outside Land of the Dead. Bakuli Jungle Wraps: Firebats deals 150–200% 250-300% increased damage to enemies affected by Locust Swarm or Piranhas. Mask of Jeram: Pets deal 75–100% 150-200% increased damage. Note: There is currently a bug which causes the new and old versions of the ring to not work when both are equipped; this will be fixed in an upcoming PTR patch. Orb of Infinite Depth: Each time you hit an enemy with Explosive Blast your damage is increased by 4% 8-10% and your damage reduction is increased by 15% 20% for 6 seconds. This effect can stack up to 4 times. Ranslor’s Folly: Energy Twister does 225-300% more damage and periodically pulls in lesser enemies within 30 yards. Triumvirate: Your Signature Spells increase the damage of Arcane Orb by 150–200% 300-400% for 6 seconds, stacking up to 3 times. (6) Set: While both Wrath of the Berserker and Call of the Ancients is active, you deal 400% 750% increased damage. (6) Set: Increase the damage of Earthquake, Avalanche, Leap, Ground Stomp, Ancient Spear and Seismic Slam by 1200% 3000%. (4) Set: Furious Charge gains the effect of every rune and deals 300% 500% increased damage. (6) Set: Every use of Furious Charge increases the damage of your next Fury-spending attack by 750% 1500%. This effect stacks. Every use of a Fury-spending attack consumes up to 5 stacks. (4) Set: During Whirlwind and for 3 seconds after, you gain 50% damage reduction and your applied Rends deal triple damage. (6) Set: Whirlwind gains the effect of the Dust Devils rune and all Whirlwind damage is increased by 800% 1700%. (6) Set: While Akarat's Champion is active, you deal 600% 900% increased damage and take 15% 20% 50% less damage. (2) Set: Your Thorns damage now hits all enemies in a 15 yard radius around you. Each time you hit an enemy with Punish, Slash, or block an attack your Thorns is increased by 35% 115% 70% for 2 seconds. (6) Set: The attack speed of Punish and Slash are increased by 50% and deal 800% 1600% 2700% of your Thorns damage to the first enemy hit. (6) Set: Your primary skills, Elemental Arrow, Chakram, Impale, Multishot, Cluster Arrow, Companions, and Vengeance deal 1200% 2100% increased damage for every active Sentry. (6) Set: After casting Rain of Vengeance, deal 500% 750% 2500% increased damage and take 60% reduced damage for 10 seconds. (6) Set: Your generators, Multishot, and Vengeance deal 40% 70% increased damage for every point of Discipline you have. (6) Set (Has been redesigned): Lashing Tail Kick, Tempest Rush, and Wave of Light have their damage increased by 600% for each stack of Sweeping Wind you have. (4) Set: Your Seven-Sided Strike deals double 777% its total damage with each hit. (6) Set: Increase the damage of your Exploding Palm by 250% 1800% and your Seven-Sided Strike detonates your Exploding Palm. (6) Set: Each corpse you consume grants you an Empowered Bone Spear charge that increases the damage of your next Bone Spear by 3000%. In addition, Corpse Lance and Corpse Explosion damage is increased by 1500%. (6) Set: Your Life-spending abilities deal 3300% increased damage but cost twice as much Life. Your healing from skills is increased by 100%. (2) Set: Enemies hit by your primary skills, Acid Cloud, Firebats, Zombie Charger, Zombie Dogs, Gargantuan, Grasp of the Dead, Piranhas, or Wall of Death are afflicted by Necrosis, becoming Slowed, taking 1500% weapon damage every second, and taking 20% increased damage from your attacks for 10 seconds. (6) Set: After casting Wall of Death, gain 1400% 1700% increased damage for 15 seconds to your primary skills, Acid Cloud, Firebats, Zombie Charger, Zombie Dogs, Gargantuan, Grasp of the Dead, Piranhas, and Wall of Death. (2) Set: When Haunt lands on an enemy already affected by Haunt, it instantly deals 120 480 seconds worth of Haunt damage. (6) Set: Soul Harvest consumes your damage over time effects on enemies, instantly dealing 300 1200 seconds worth of remaining damage. (6) Set: Your damage is increased by 120% 200% 150% and damage taken reduced by 3% for each enemy that is Ignited. This effect can stack up to 20 times. You always receive the maximum bonus whenever a nearby Elite monster is Ignited. (6) Set: Increased number of Archon stacks gained when hitting with an Archon ability from 1 to 2 You also gain Archon stacks when you hit with an Archon ability. Archon stacks now also reduce damage taken by 0.15% and have their damage bonus increased to 18%. 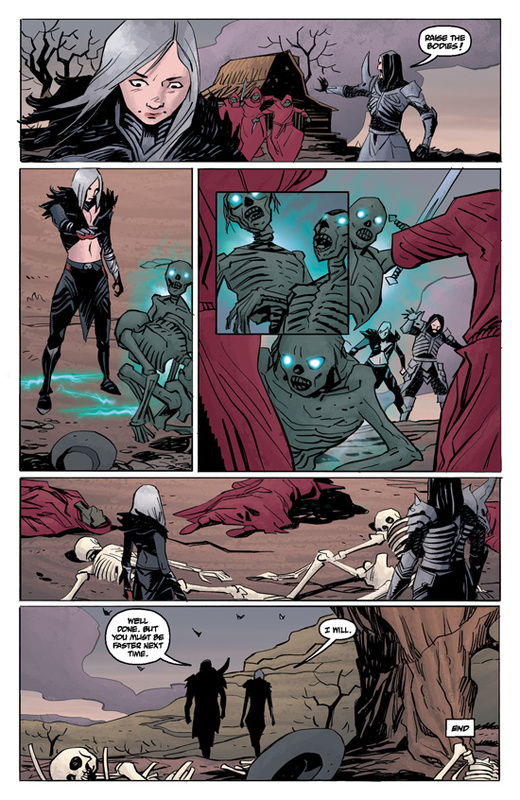 Blizzard Entertainment posted a 7-page digital comic (by Valerie Watrous) based on the female Necromancer. The first page with the child necromancer holding eggs reminds me of one of the events in Act II in the Shrouded Moors. One peculiar thing in the digital comic is the Necromancer lives in some ancient temple beneath the ground. The doorway into this stronghold is at the roots of a big tree. Not long ago (in May 3), during the Necromancer Q&A, Julian Love mentioned the white hair of the necromancer would be explained by some other media. This digital comic didn’t particularly answer this which suggest there might be a male necromancer digital comic, or a continuation of the female necromancer, or some yet a different media. Hopefully, we get to see a graphic novel at some point, or a novel. If you missed the Q&A livestream, follow the link above for the video. I also transcribed the entire thing. The recent Diablo III: Rise of the Necromancer press release had a sweet image attachment containing the newest Alex Horley artwork adding the necromancer to the roster of Diablo III heroes versus Diablo the Prime Evil. It is wicked and cool to add as your wallpaper. 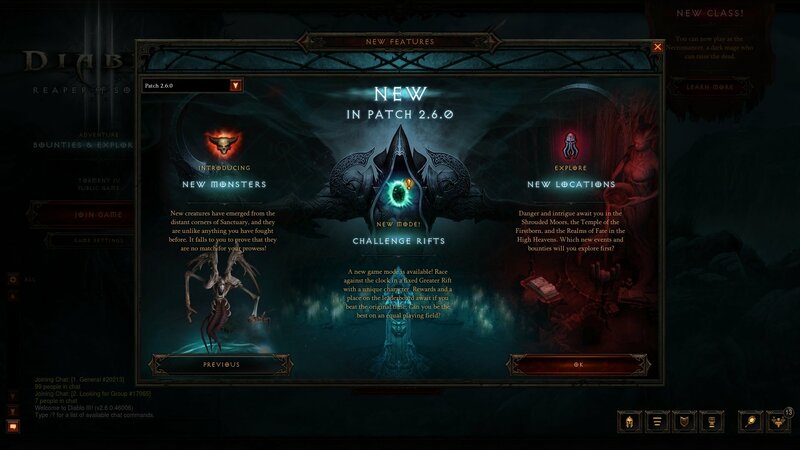 Blizzard Entertainment deployed Diablo III Patch 2.6.0 with free content (even if you don’t buy the Rise of the Necromancer pack). The content includes new creatures, Challenge Rifts, Shrouded Moors (Act II), the Temple of the Firstborn, and the Realms of Fate (Act IV). How to Buy Diablo III: Rise of the Necromancer with a WoW Token? Update: Noticed the tax increased the amount from $14.99 to $16.32 total. The WoW Token won’t be enough to cover that. I had to add $1.00 via credit card to complete the amount. Diablo III: Rise of the Necromancer is on sale after June 27th for $14.99, but you can get it for Free with a WoW Token. 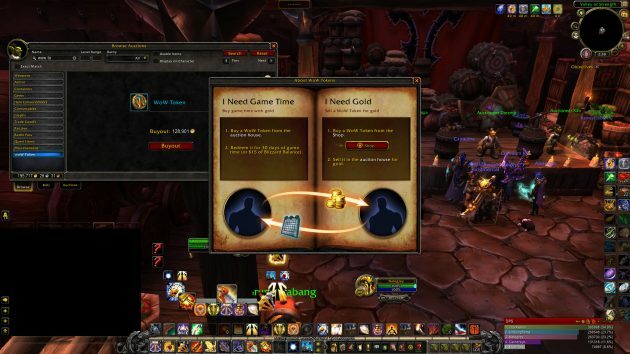 Free in the sense that there is no actually cash or credit card involved, but it costs World of Warcraft in-game gold instead. This is how to buy Diablo III: Rise of the Necromancer with a WoW Token. 1. Go to Orgrimmar or Stormwind. 2. Open the Auction House window. 3. 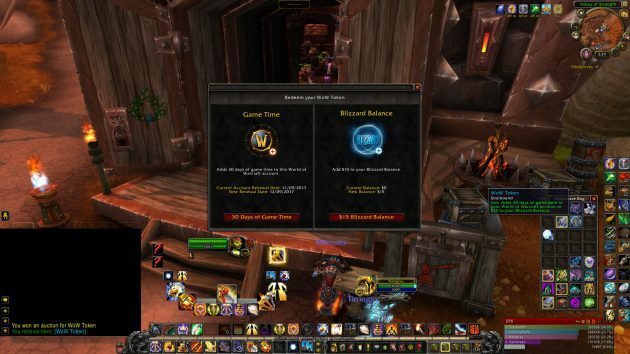 Click the WoW Token tab. 5. Go to your in-game Mailbox. 6. Click the WoW Token in your bag/inventory. A window opens onscreen asking you to choose Game Time or Blizzard Balance. In this case, choose Blizzard Balance. 7. What this does is give you credit for $15 in Blizzard Balance. Diablo III: Rise of the Necromancer costs $14.99, which make it Free at the cost of World of Warcraft gold. 8. If you go to the Battle.net Account Management page (USA | Europe) you can now see $15.49 in your Battle.net Balance. Update: The tax raises the cost to $16.32. You might still have to use a credit card to add a minimum of $1.00 and it might take up to three days for the Blizzard Balance to update the extra amount. As discovered today, it turned into a hassle. 9. On June 27, go to Diablo3.com and purchase Diablo III: Rise of the Necromancer using your Battle.net Balance. A week before the official launch of Diablo III: Rise of the Necromancer, Blizzard Entertainment featured today a first look into The Shrouded Moors. You can read further details at the official website. Sanctuary is a big place, and in Patch 2.6.0 it’s about to get bigger! With new areas appearing in Acts II and IV of Adventure Mode, there are more places to explore, more bounties to complete, and more monsters to slay. Blizzard Entertainment announced the Diablo III: Rise of the Necromancer pack is going live on June 27 for $14.99. The pricing by itself is kinda surprising. It is quite a low price compared with other pricing models for other Blizzard games. In addition to the new hero, two stashes, two slots, and the other cosmetic perks (for $14.99), Blizzard is also giving you new areas: Shrouded Moors (Act II), Temple of the Firstborn, Realms of Fate (Act IV); plus the Greater Rift Challenge Mode feature– these are provided to the players for free in the upcoming Diablo III patch 2.6.0. Personally, I don’t think there will be a Diablo IV any time soon. For example, StarCraft II is a 6-year old game that went through three episodes (if we may call them that): Wings of Liberty, Heart of the Swarm, and Legacy of the Void. Then, Blizzard released a three-part pack: Nova Covert Ops for … $14.99. Is that pricing model familiar? Then they also release a new Co-Op Commander every few months for $4.99. Blizzard Entertainment has announced the official release date for the Diablo III: Rise of the Necromancer pack. On June 27, the pack will be available for PC, Xbox One, and PS4 for $14.99 in the United States. Read the press release, and afterwards the FAQ. IRVINE, Calif.– As the Burning Hells invade Sanctuary and all hope seems lost, an unlikely hero rises to restore balance to the world, calling forth an army of the dead and cleansing the land of evil. From the crypts deep beneath Blizzard Entertainment today came a dark invocation proclaiming that the Rise of the Necromancer™ pack, which summons the much-anticipated necromancer class into Diablo III: Reaper of Souls, will be unleashed June 27 — available to those in the living realm digitally in-game on PC or through the online Blizzard Shop, PlayStation®Store, and Xbox One Store.